Given the following figure and the following variables and parameters, I have been able to come up with the set of differential equation below the image. My question is how does the system of equations $1$ which I produced myself differ from the set of equations $2$. Below I have a further explanation of this question. The image below was used to create my system of equations $1$. $R(t)$: number of susceptible T-cells (number, $ R(t) \geq$ 0). $\mu$: removal rate of T-cells (1/time, $\mu\geq0$). $\beta$: rate of T-cell infection (1/number/time, $\beta>0$). $\pi$: rate that virus is produced by actively infected T-cells (1/time, $\pi >0$). $\sigma$: rate of virus removal (1/time, $\sigma >0$). So clearly there is a difference between the number of infected T cells in system of equations $1$ and $2$. System of equations $1$ includes the term $\pi E$ while system of equations $2$ does not in equation 3. Why is this? There is a difference between the amount of virus in system of equations $1$ and $2$. System 1 includes the loss of term $\beta VR$ while the system of equations of $2$ in equation 4. Why is this? 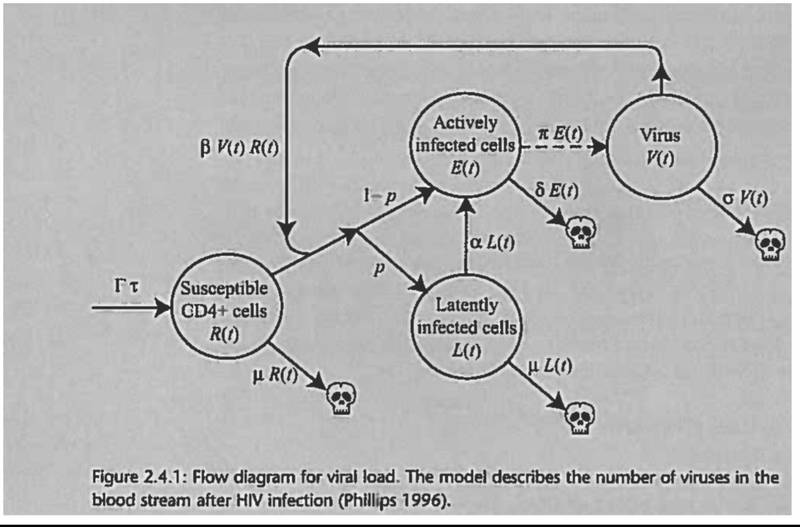 Browse other questions tagged immune-system hiv or ask your own question. Which is harder to contract - HIV or AIDS? Can HIV mutate to become airborne? Why is HIV associated with weight loss/being underweight? Do HIV particles die without host cells?